AIM's downfall owes largely to the ubiquity of Facebook chat. And now, the company's going after the mobile crown—texting. 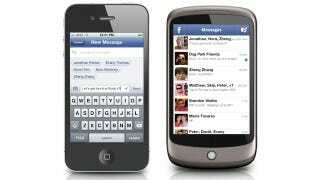 Facebook Messenger will do text conversations, privately share your location, and beam around photos. To all of your friends. The dedicated Messenger app will be separate from the main Facebook app for iOS and Android, offering a one-click jump into group or individual messaging. If your pal's on Facebook (which they almost certainly are), they'll get your message in their FB inbox. If they're not, or don't have Messenger installed, you can send your missive via SMS instead, without either of you noticing a difference. Chat room-style conversations will be available, a la BBM, with room topics for easy sorting. If you want to sling your coordinates to a pal, you'll be able to send them a drop pin of your location on a map. Enjoying the pizza you're eating at that location? Share a photo too. All of this will be push notification-enabled as well-meaning you've got a hell of a powerful, consolidated communications toolkit in your pocket, and an actual reason to consider replacing your phone's default messaging app.